Are you looking to get a new SUV with tons of space, but feel like your only choices are huge gas-guzzlers? Then you should take a look at the new 2019 Toyota Highlander Hybrid! The new Toyota Highlander Hybrid is the latest edition of Toyota’s hybrid version of its popular large crossover model that offers the best of both worlds, tons of space for passengers and cargo but with hybrid efficiency! If you’re looking to learn more about the 2019 Toyota Highlander Hybrid, you’ve come to the right place! For this model research page, we’re going to do a deep dive on the large hybrid crossover from Toyota and everything it has to offer from its performance, efficiency, interior space and features. How efficient is it? How much cargo space does it have? We’re going to answer that and more, right here! Let’s see what the 2019 Toyota Highlander Hybrid has to offer drivers! 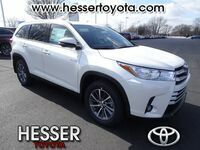 Test Drive the 2019 Toyota Highlander Hybrid at Hesser Toyota in Janesville, Wisconsin, Today! Of course, the first thing that everyone wants to know about a hybrid vehicle is its efficiency. The 2019 Toyota Highlander Hybrid comes standard with a 3.5-liter V6 engine and electric motor to produce a net horsepower of 306 hp. Not bad for a hybrid! But the real selling point of the 2019 Toyota Highlander Hybrid is its efficiency, getting up to an EPA-estimated 30 city and 28 highway mpg. Thanks to its incredible efficiency for its size, the 2019 Toyota Highlander Hybrid has a Super Ultra Low Emission Vehicle rating. Just because the 2019 Toyota Highlander Hybrid is a hybrid, doesn’t mean that it’s small! In fact, the 2019 Toyota Highlander Hybrid is one of the most spacious crossovers in its class, with seating for up to eight passengers with a standard 13.8 cubic feet of cargo space left over. And, drivers can expand that space to 42.3 cubic feet and 83.7 cubic feet by folding down the third and second-row seating. Efficiency and space, it’s what you get with the 2019 Toyota Highlander Hybrid! But what about when it comes to technology and features? Don’t worry, the 2019 Toyota Highlander Hybrid is full of those too! The available Entune Multimedia Bundle comes with an available 8-inch high-resolution touch-screen display with features like integrated navigation, integrated SiriusXM and numerous other popular apps. Plus, the available Bird’s Eye View Camera helps drivers in tight spaces by giving them an aerial, 360-degree view of the 2019 Toyota Highlander Hybrid! Want to learn more about the 2019 Toyota Highlander Hybrid? Ready to get behind the wheel of one? Contact our staff at Hesser Toyota for more information or to schedule a test drive today!